InSite SiteWork software provides powerful stripping and demolition tools. 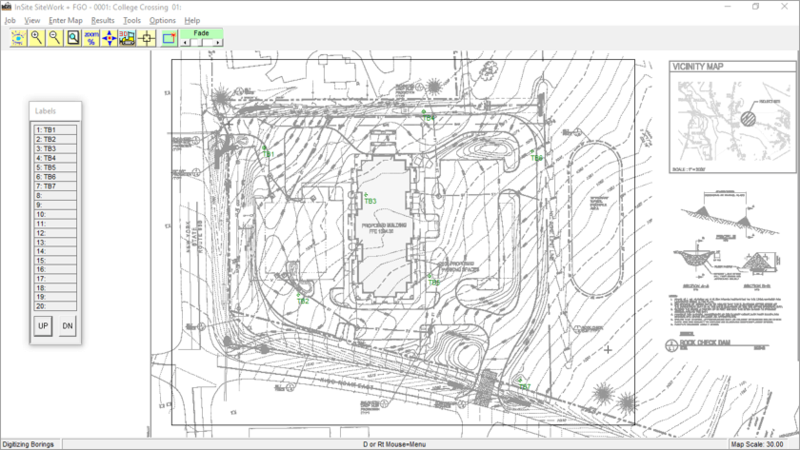 Quantify initial topsoil removal, demolition of existing paving, building pads, etc. and unsuitable material shown in the boring logs. Quickly calculate initial topsoil removal to stockpile. Image courtesy of Topcon Positioning Systems, Inc. Quantify removal of existing paving, building pads, etc. Easily quantify unsuitable material (more accurate that averaging) shown in the boring logs. Enter the stripping or demolition depth for regions where material is removed evenly below grade or when boring data doesn’t exist. Identify topsoil or demolition materials (paving, concrete, sub-base, etc.). Strip to strata for regions where an unsuitable strata is to be removed. InSite quantifies the stripping and demolition! All cut and fill numbers will be from the new stripping surface.